Classic tonsu design elements melded with contemporary functions conceal a wide-screen television and stereo components with ample storage for CDs, DVDs and LPs. 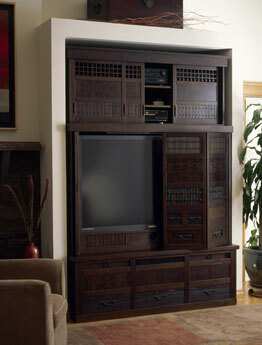 Hand wrought iron pulls imported from Japan and walnut-stained, textured elm convey a sense of history. First Place Winner of the Seattle Design Center's Northwest Design Awards 2004, in the category of Residential Smart Solutions.